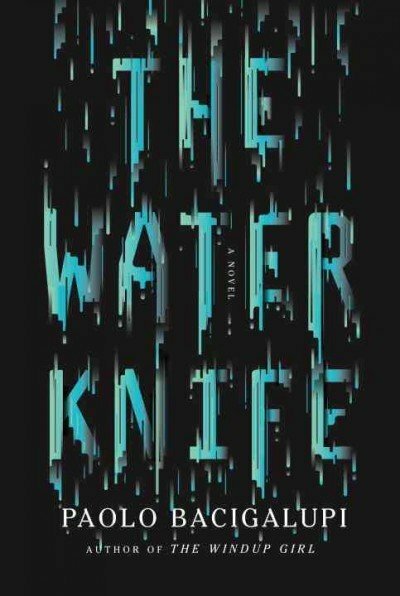 Today we have my favorite book of the year, with a view into a future where water may just be the most valuable resource in this part of the world. I have been a fan of Paolo Bacigalupi since The Windup Girl, which was also a startling view into a potential future earth that has undergone great political and cultural shifts due to climate change. 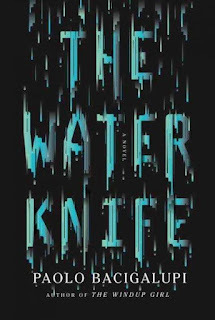 The Water Knife also places us in a near future scenario deeply influenced by climate change. This time the south western United States. Water is a valuable commodity and the Colorado river the lifeblood of several states, who have all closed their borders and effectively begun acting like sovereign states. The story is rooted in the tensions between the practically militarized water agencies of Nevada, California, and Arizona. It paints a vivid picture of a world in which entire states have collapsed, most notably Texas, and deals with the repercussions of the migration that causes. The narrative follows three characters. Angel, the 'Water Knife' of the title (a name given to the private soldiers of Nevada) is a mercenary who had escaped the cartels in Mexico. He now works for Catherine Case, the most powerful water baron of the region, and the head of Nevada's water agency. Case sends Angel to Phoenix undercover to root out a possible plot against her. There, Angel encounters Lucy Monroe, a hardened journalist, who knows far more about Phoenix’s water secrets than she admits, and Maria Villarosa, a young Texas migrant, who dreams of escaping north to those places where water still falls from the sky. The perspective switches from character to character superbly, and each has there own unique view on this crumbling world where the wealthy try to stay wealthy and care little for those suffering beneath them. The conspiracy slowly unravels, and it all builds up to bring the three characters together. There may a couple of obvious 'twists' but the pacing makes up for it. As with his other work, Bacigalupi is at his best when describing the reality of his possible futures. It feels like a real place, it all seems so very plausible, and that it adds a degree of credibility to the characters, and their motivations. A someone living in California, there is definitely an edge to the story being told, and it seems all to possible. It's dystopian, but in a way that you believe could happen. A great read for all but the most staunch climate deniers.